Boston, MA - During the weekend of October 10-11, 2009, St. Sava Serbian Orthodox Church of Boston celebrated the Great Consecration of its new church in Cambridge, Mass. The new 13-foot iconostasis, made of solid walnut, was meticulously hand carved over the course of three years in Serbia, and recently arrived in Boston to be installed in its home. In addition to the biblical scenes and scripture incorporated into the carvings, the iconostasis features large hand-painted icons. The iconostasis was made by woodcarver and icon writer Djordje Bilak of Novi Sad, Serbia. Also included was Christ’s Tomb and a Bishop’s Throne carved by Ljuban Maric from Valjevo, Serbia. 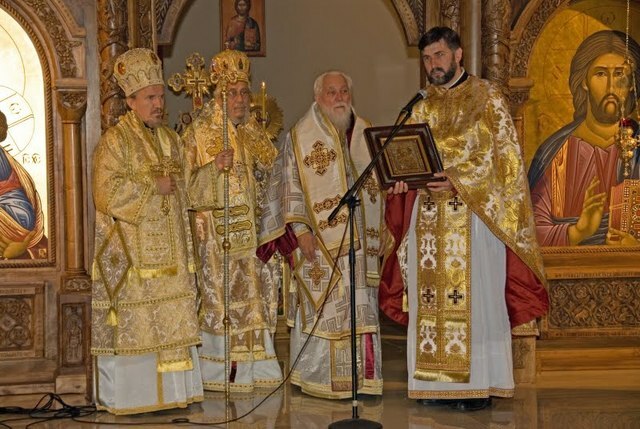 St. Sava Church was blessed to receive relics of St. Czar Lazar of Kosovo and St. Anastasia, the mother of St. Sava. 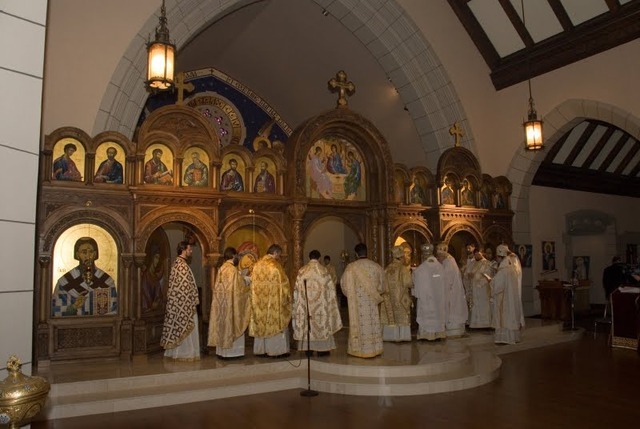 The weekend’s services were lead by four bishops, His Eminence Metropolitan Christopher of the Libertyville-Chicago Metropolitanate, His Eminence Metropolitan Nikolaj of the Dabrobosna Metropolitanate, His Grace Bishop Mitrofan of the Eastern American Diocese, His Grace Bishop Longin of the New Gracanica-Midwestern Diocese, and St. Sava’s own pastor, Very Reverend Father Aleksandar Vlajkovic. Also serving were three deacons and many clergy from across the United States, including those of other Orthodox churches in the Boston area. Out-of-town guests included faithful from the New England region, as well as from Illinois, Pennsylvania, Ohio, New York, New Jersey, Florida, and North Carolina. Also in attendance were Branko Radosevic, Consul General of the Republic of Serbia, Peter Borkovich, SNF President, and Millie Radovick, Eastern Diocese Kolo President. The Kumovi of the Consecration, as well as the donors of the iconostasis, were Donald and Milica Pogorzelski. 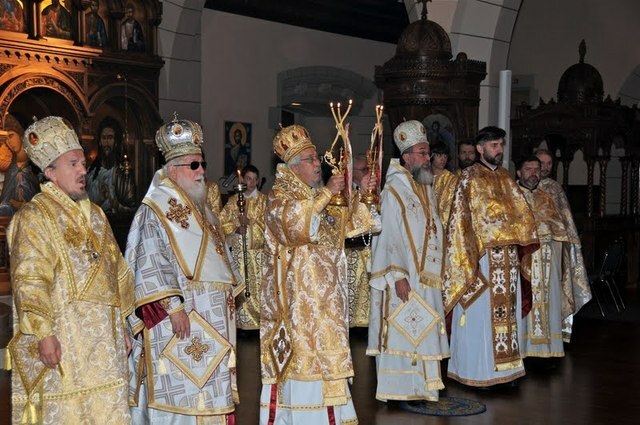 The celebrations began on Saturday with a Vigil Service at 5 p.m., where 300 faithful and children in Serbian folk costumes as well as dancers of Gracanica Serbian Folk Dance Ensemble greeted the bishops and relics. The Rachmaninoff Choir of Maine sang the responses, and the service was followed by a festive dinner reception in the church hall prepared by the St. Petka Circle of Serbian Sisters. On Sunday morning at 9 a.m., the beautiful Consecration services took place, followed by a Hierarchical Divine Liturgy, where His Eminence Metropolitan Nikolaj gave the sermon and presented the parish with a copy of the well-known icon from Cajnice, Bosnia, of the Mother of God and Christ (Bogorodica Cajnicka). The responses to both services were sung by the Branko Radichevich Choir of Chicago. Afterward, an elegant catered banquet was held in the church hall, where guests were addressed by His Eminence Metropolitan Christopher, His Eminence Metropolitan Nikolaj, His Grace Bishop Mitrofan, His Grace Bishop Longin, Fr. Aleksandar, Church Board President Branko Glisovic, and Kum Donald Pogorzelski. The Branko Radichevich Choir gave a concert, and afterward, guests enjoyed a dance with live Serbian music by the local band Vidovdan. The mission of St. Sava Church was founded in 1973, was revived in 1992 by His Grace Bishop Mitrofan, and in 1994 received its first full-time priest, Fr. Aleksandar. Parishioners worshipped in a small church converted from an office building in Wakefield, Mass. In 2005, the parish purchased its church building located in Cambridge, Mass, and celebrated its first Divine Liturgy on January 1, 2006. The Great Consecration was a proud and moving historical moment for the parishioners of St. Sava Church. For more information, please visit www.stsavaboston.org.